Aideen | what will i wear today? You are currently browsing the tag archive for the ‘Aideen’ tag. Following on from Beyonce’s yesterday, here comes another video lookbook that appears to be filmed (as Kitty Cat described it) in a crack den. The full campaign stars flavours-of-the-year Zoe Kravitz and Abbey Lee Kershaw. Behold the new Alexander Wang Autumn 2010 collection. And I’m not sure I love it. Which is unexpected. Actually you know what? It’s far too gothic for me. But there’ll be plenty who think it’s tha shiz. Eh Bouncy’s new season line is crap. We’re talking studded leggings, sharp shoulders and tattoo transfers. Guuuuuuurl we’ve seen all that before. C’mon you can afford some hip and trendy hipsters to come up with your collection. What gives? I suppose she wants it to sell. Well it’ll do that anyway. Her frequent bending over in the ad campaign will probably take care of that. The line is named after her maternal grandmother, Agnèz Deréon. Not to be confused with Tina and Beyonce’s label House of Deréon, this one is a Solange and Beyonce sibling affair. But to be honest, you’d fare better shopping in Japan on Henry Street. Oh Isabel Marant, you are KILLING me. Your fashion is so accessible, so utterly ridiculously divine – I nearly break out in a rash, I get a case of The Want so badly. Now when I say accessible, I don’t mean in monetary terms. We’re talking about starting at over a grand for most of her items in the collection. Still, I reckon this is a look that’ll get turned around on the high street fairly quickly. Hopefully by October, we can have ourselves a few Marant-inspired pieces. Topshop has a veritable feast of covetable items in its collection for A/W. Curse being only able to afford one or two things! This dress is actually stretching the ‘high street’ price tag – it costs £225 which converted to euro is 270. And you know they’ll mark it up in euro some more. 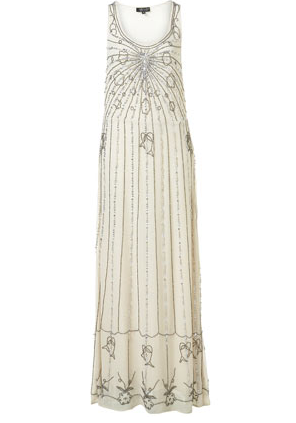 It’s so gorgeous though, I nearly WANT to get invited to a wedding so that I could have an excuse to buy it.